Jo and Claire are longtime friends bound together by an unspeakable tragedy from their childhood. The two now grown women are stuck in the small Scottish town of Banktoun though for different reasons. Jo is shocked when her boyfriend suddenly tells her it’s over but another unexpected encounter threatens to throw her completely off balance. While a heatwave scorches Banktoun DS Davie Gray tries to find the masked perpetrator that has been scaring girls in Banktoun. Could the events of someone from Jo and Claire’s past resurfacing and the appearance of the man with the balaclava be related? Jo is desperate to find out, even if trying to unearth the secrets from the past could put her in grave danger. Honestly, I have become a tad allergic against publishers hyping each writing debut as the next best thing in crime writing, as I have been disappointed more than once on that matter. However, having said that I am pleased to say that Black Wood is really a debut worth reading! Living in a small community I could perfectly relate to the way SJI Holliday describes Banktoun and its inhabitants. The keen observation of everyday small town life puts the reader right into the middle of the story. Everyone knows everyone in the narrow environment that is Banktoun and you have all the ‘usual suspects’ like the old gossip hag of which I am sure everybody knows one. People keep many secrets in Banktoun, some tragic and heartbreaking yet only too human, however, some are much darker than others. I immensely enjoyed Black Wood. The setting is perfect, the characters are all completely authentic and I also loved the fact I couldn’t predict what would come next. Holliday cleverly weaves the mystery of what happened to the girls over twenty years back, giving the reader only tiny glances of what occurred from the view of different characters. The showdown of Black Wood is very grim and the truth about what took place is a real tragedy and was also not foreseeable in my opinion. 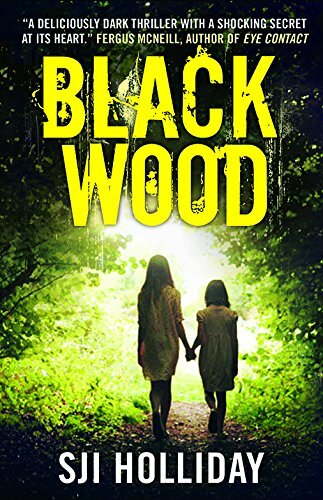 Black Wood is a perfect mystery with unique and great characters and it’s an unusual thriller that you won’t feel you’ve read already a hundred times before.